To honor Scott’s tremendous dedication and many contributions to Rye Country Day, the Board of Trustees has created the Scott A. Nelson Scholarship Fund. This need-based financial scholarship will be awarded to an Upper School student in perpetuity. Through direct donations or by purchasing an engraved seat plaque for the Dunn Performing Arts Center your gift supports the Advancing a Tradition of Excellence Campaign. To honor Scott’s tremendous dedication and contributions to Rye Country Day, the Board of Trustees has created the Scott A. Nelson Scholarship Fund as part of the Advancing A Tradition of Excellence capital campaign. This need-based financial scholarship will be awarded to an Upper School student. Given Scott’s personal story, we know that such a scholarship will be especially meaningful to him. Scott, himself, was a financial aid recipient in high school and went on to excel academically and athletically at Brown University. Scott’s focused, consistent, and consensus-driven leadership has enabled RCDS to evolve into one of the most highly regarded schools in the intensely competitive New York City and tri-state suburban areas. In every measure used to evaluate private schools, RCDS has been on a steady upward trajectory over the course of Scott’s tenure. Our admissions have never been more competitive. Financial aid has grown significantly, allowing over 140 students to participate fully in the life of the School. Attrition is just 2-3 percent, one-fifth the national average. College matriculations of our graduates are extremely selective and quite possibly unmatched among Fairfield/Westchester county schools. Fund-raising has been incredibly successful, with 98 percent of current parents participating in annual giving, well above the national average of 67 percent. RCDS is not only a pre-eminent school in our area, it is also nationally recognized as a top independent school in the country. This remarkable transformation did not happen by accident. Scott has guided the school with honesty and integrity. He has created an ethos of excellence among faculty, staff, and students that pervades all endeavors. The result is an academically rigorous yet compassionate environment in which each student is known, valued, and celebrated. More than an accomplished educator, Scott is also a strong business manager who understands the importance of inspiring excellence and carefully tending to all facets of the School, including community relations, vendor management, and employee benefit programs, to name a few. Scott’s legacy will be defined by academic excellence, outstanding faculty and staff with a passion for growth, campus expansion and consolidation, and solid fiscal management. 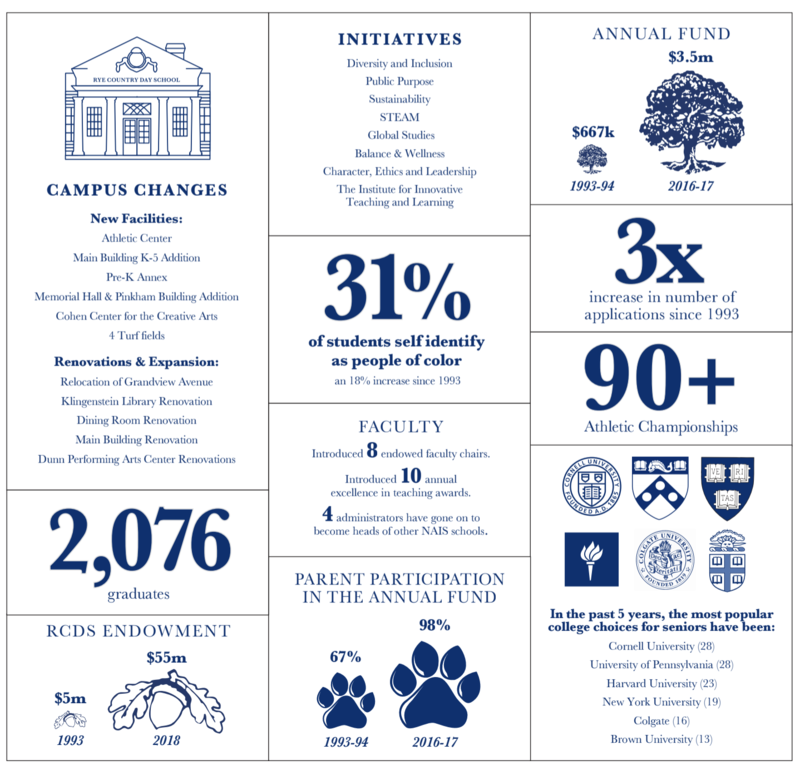 In case you were wondering if Scott has plans to leave RCDS soon, the answer is a reassuring and resounding “no!” Scott’s commitment to our community, to the capital campaign, and to the strategic plan goals remains steadfast. He is excited about leading RCDS forward. We hope that you will join us in thanking Scott for his years of service to RCDS by supporting the Scott A. Nelson Scholarship Fund. An Engraved Seat Plaque in the Dunn Performing Arts Center is a thoughtful and enduring way to honor Headmaster Nelson's 25th Anniversary, celebrate the reopening of the Dunn Performing Arts Center, and honor your family's ongoing relationship with RCDS. You may name a seat in the Dunn Performing Arts Center with a tax-deductible contribution of $2,500. The names of current students may not appear on the plaques. Plaques will be placed on seats beginning at the front of the PAC theater in the order they are received. All proceeds from plaque sales will benefit the Scott A. Nelson Scholarship Fund.